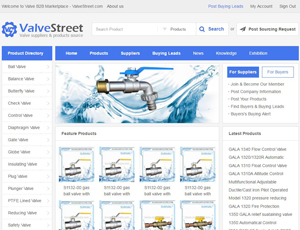 ValveStreet.com is an international e-commerce platform which focuses on the import and export of valves. It has now established itself as the world's leading professional valve online B2B trading site. ValveStreet.com is a network hub which connects China, home to the world's largest valve factories, manufacturers,suppliers, exporters, and wholesalers to valve buyers from all corners of the world. ValveStreet.com also works to promote efficient online trading of valves and related products. About Valvestreet.com - Online Valve Manufacturers,Suppliers B2B marketplace's recommend,only on behalf of the views and opinions about B2B Directory, if you have any suggestions , please feel free to contact with us, we will amend and correct them in the first time according your suggestions. More better B2B Websites recomend, Please click here.